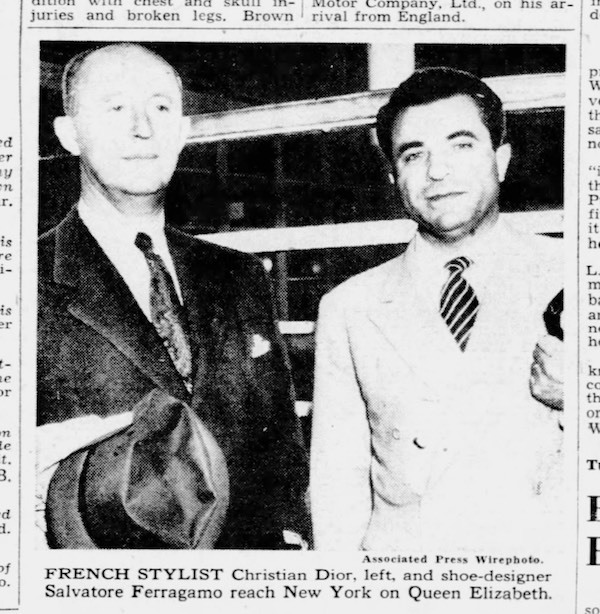 Off the Queen Elisabeth a week ago came Christian Dior and Salvatore Ferragamo, the first a Paris dress designer, the second an Italian shoe creator. Dior takes credit for nailing down this season's hemline; Ferragamo was first with the spike-wedge to women's shoes. Both are here to receive the Neiman-Marcus award in Dallas, Tex. Their third confrere, Norman Hartnell, of London, couldn't get away - princess wedding business. Dior says come hell or high water, French women are going to wear longer skirts, as long as 12,5 inches from the floor —which is very long. He thinks American women will wear them, too, even If it means tossing out last season's togs. 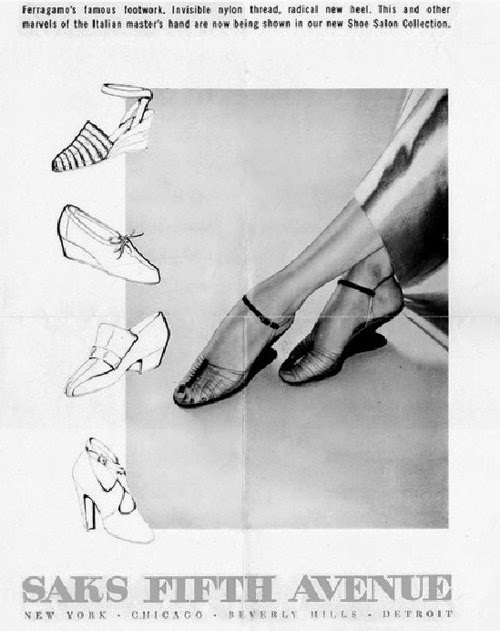 Ferragamo predicts that a wealth of new shoe ideas will emerge from the advent of the new silhouette. Women will not have to discard their shoe wardrobe as a result of the fashion change, he says comfortingly. The height of the heel is unimportant. 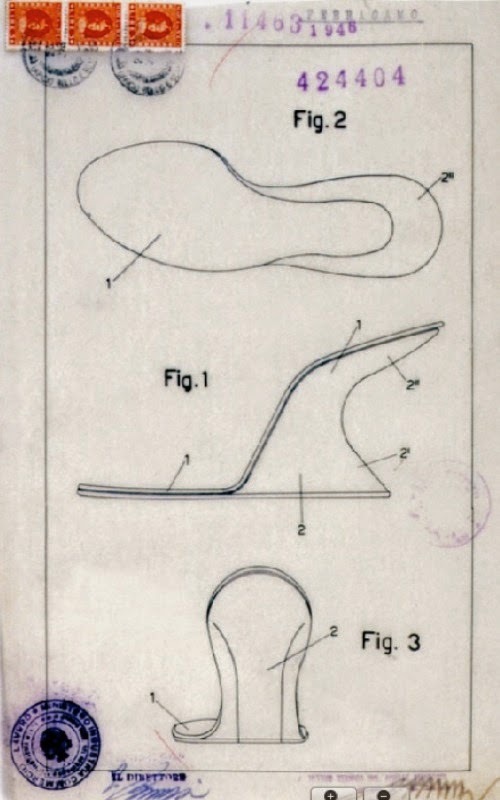 The line of the shoe itself and its relation to the height of the body are what will make footwear news. I did not arrive in Dallas alone. I had a French mentor with me, André Janet, who had lived many years in America. His task was to smooth both my journey and my stay in Dallas. 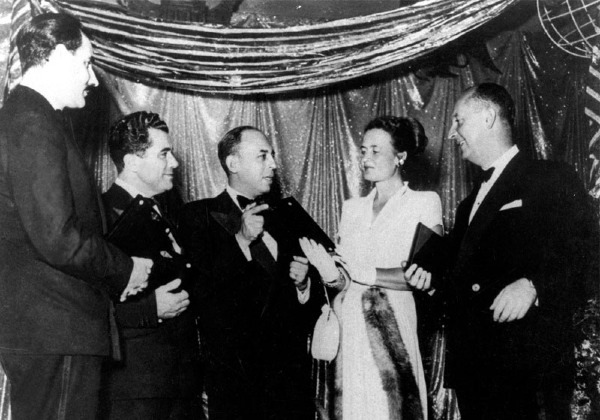 First of all he told me that the celebrated Hollywood dress designer, Irene (Lentz), and the famous Italian shoemaker, Salvatore Ferragamo, would be receiving Oscars at the same time as me. … shortly after Alfonso Caldini, a worker with me since 1929, returned from a fishing trip on the Arno. He caught a big fish using a new type of nylon thread. "The fish do not see it" he explained. This was the stuff I needed to make it happen an inspiration. I took a long transparent nylon thread, twisted it and wrapped it around a "carved" heel. 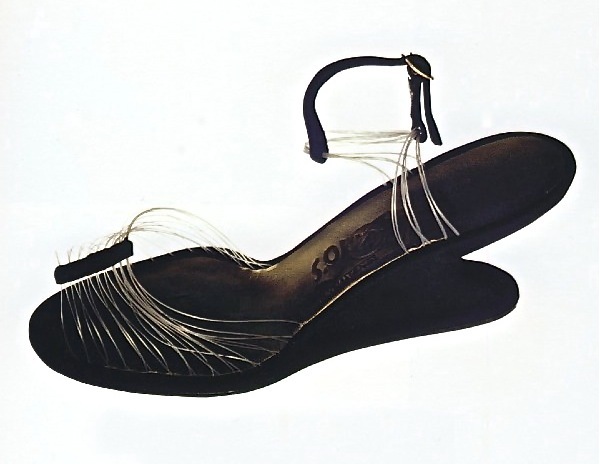 The result was the "invisible" shoe, a model that helped me to win the Neiman-Marcus award. 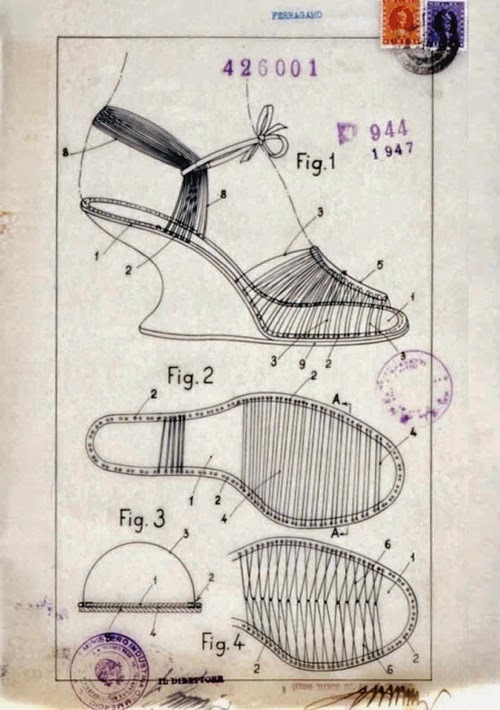 It was never a best seller because the sandal left the foot so naked that few women were willing to accept such a challenge to the beauty of their feet. The awarded invisible sandal, upper made by a single nylon thread and black kid. F-shaped wooden heel covered with black kid. 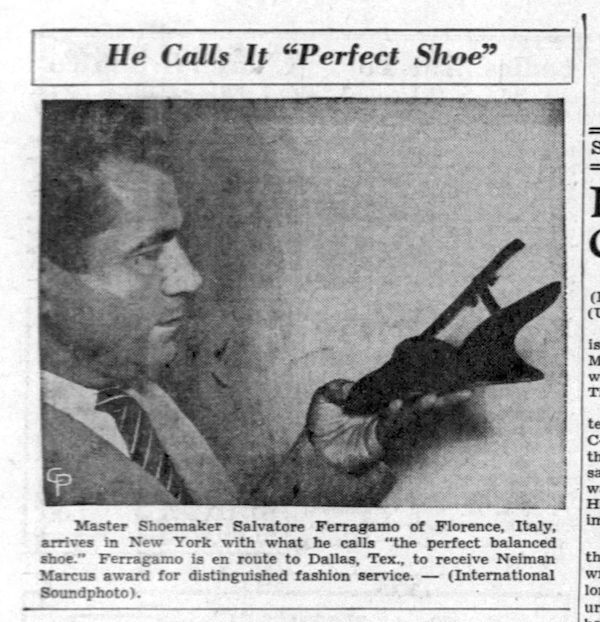 Even the Italian Footwear Oscars - created by the International Footwear Academy of Turin, were linked to Salvatore Ferragamo: the first edition (1961) was dedicated to the famous shoemaker who passed away the year before.